Retail Holdings announced today that a 54.1% owned subsidiary has entered into an agreement to sell their whole stake in Singer Bangladesh for $75 million. Given that Singer Bangladesh is the largest remaining piece of Retail Holdings assets this gets the company pretty close to the finish line with regards to their plan to fully liquidate. Besides Singer Bangladesh they only have a 60.8% stake in Singer India left that is also owned indirectly through the same subsidiary. While the sale of Singer Bangladesh is nice, the price is very disappointing. Retail Holdings owns (indirectly) a 37% stake of Singer Bangladesh that is worth $91 million based on the latest market price in Bangladesh. Besides this stake, they also own a 20% stake consisting of non-remittance shares and these shares have $15 million in accumulated unremitted dividend distributions. Given the restrictions these shares have with regards to paying distributions to shareholders outside Bangladesh it makes sense that these are worth substantially less than normal shares, but I think they should certainly be worth something. Selling their whole Singer Bangladesh stake for a discount to the latest market price and throwing in the non-remittance shares and their accumulated unremitted dividend distributions for free seems a pretty bad deal. In a best case scenario, with a zero percentage discount, these assets could be worth $155 million, more than twice the agreed upon price of $75 million. Despite the bad deal the stock is up a tiny bit today, which makes sense. Most of Retail Holdings market cap will soon consist of cash, and presumably be returned to shareholders. Taking into account the $75 million that will be received for their Singer Bangladesh stake, NAV/share stands roughly at $12.40 which means that there is actually a little bit of upside left from today’s share price of $11.66. Guess that shows that buying stuff with a sufficiently big discount does offer some margin of safety, but still: I’m pretty disappointed by this outcome. This entry was posted in Portfolio and tagged RHDGF on March 22, 2019 by Alpha Vulture. My oldest position in my portfolio is Argo Group. I bought my first shares not long after starting this blog in 2012 at 14.69p/share and while there have been a couple of dividends since, and the opportunity to buy more at significantly lower prices, the stock hasn’t exactly been a home run with a current price around 18p/share. Nevertheless, the company remains very cheap, trading at roughly a 50% discount to net current asset value. Argo’s management has recognized this, and reduced the number of outstanding shares with 30% since 2012. But at the same time this has cemented their control over de company as well since they now control 52.7% of the outstanding shares. Last week Argo announced that it is launching a tender offer to purchase between £2.0 million and £2.5 million worth of shares in a Dutch auction action with a price range between 18p/share and 26p/share. If you don’t have a position yet in the company you can stop reading here, because the offer is only open to shareholders who held their shares on the record date of 6 March. But since I already own the stock I had a decision to make. Argo Group has a net current asset value of 36.5p per share so I’m absolutely not interested in selling at 18p/share. But at 26p I think it’s a reasonable deal. I get paid a 50% premium to the latest market price, and the company would still be purchasing shares at a 30% discount to NCAV. I’m okay with a deal that’s a win-win for both parties, and at that price the discount is basically split “fairly” between exiting shareholders and remaining shareholders. By tendering at the highest price of the range there is of course a risk that none, or not all my shares, will be accepted in the tender offer, but I think that’s a risk worth taking. 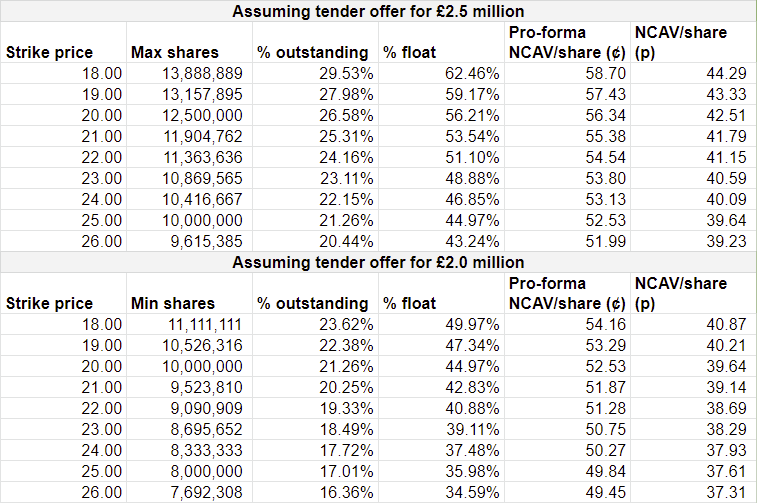 If the tender offer is completed at a lower price it would provide a nice boost to NCAV/share anyway, and most likely the stock price will follow. And most importantly, at 26p I’m selling it cheap enough already! A sort of interesting twist in the tender offer is the fact that the company can pick if they want to buy back £2.0 million worth of shares or £2.5 million worth of shares. At a price of 18p that corresponds to 50% to 60% of the float while at 26p it corresponds to a percentage between 35% and 43%. Given that it’s such a big percentage of the float, I expect that it’s quite likely that the tender offer will go at the maximum of the range. But because the company has the ability to scale back the number of shares they have to buy I do think it’s important to not tender low with the expectation that it will not really matter in the end result. This entry was posted in Portfolio and tagged ARGO.L on March 15, 2019 by Alpha Vulture.